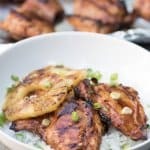 A tropical sesame-soy BBQ marinade sweetened with pineapple juice is the basis for this tender Grilled Hawaiian BBQ Chicken. 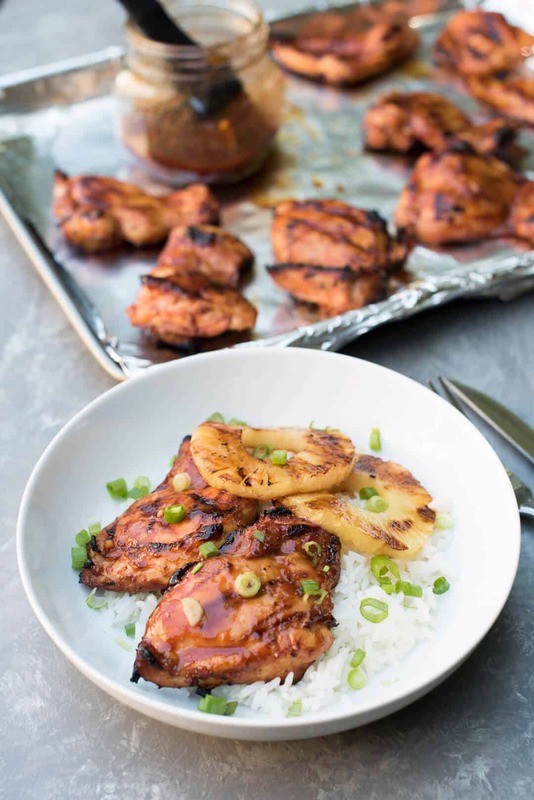 Serve over rice with grilled pineapple slices for a truly incredible summer meal! I’m bringing you this recipe just as summer hits full swing around here. We’ve got a full house with our recent college grad home to visit for the 4th of July weekend with his girlfriend. Since he has to head back to Santa Barbara on the 4th, we’re doing some early celebrating around here. Later today all his brothers will descend upon the house for a big family cookout for which I am completely unprepared! As soon as I hit publish on this post I’ll be pulling together my menu and zipping over to Costco. 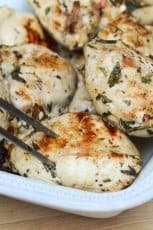 I hope you’re all more organized than I am today but if you don’t already have your menu planned for your 4th of July celebration, this chicken would be a fabulous choice. It was dinner for us last night. When it’s summer and we’ve got lots of folks to feed, the BBQ gets fired up many a night. I love grilling in the summer because first, Paul has to help make dinner which pretty much never (okay, NEVER) happens otherwise. He mans the grill while I attend to the rest of the meal (aka, pour myself a glass of wine). This chicken! You’ve got to try it. Please. 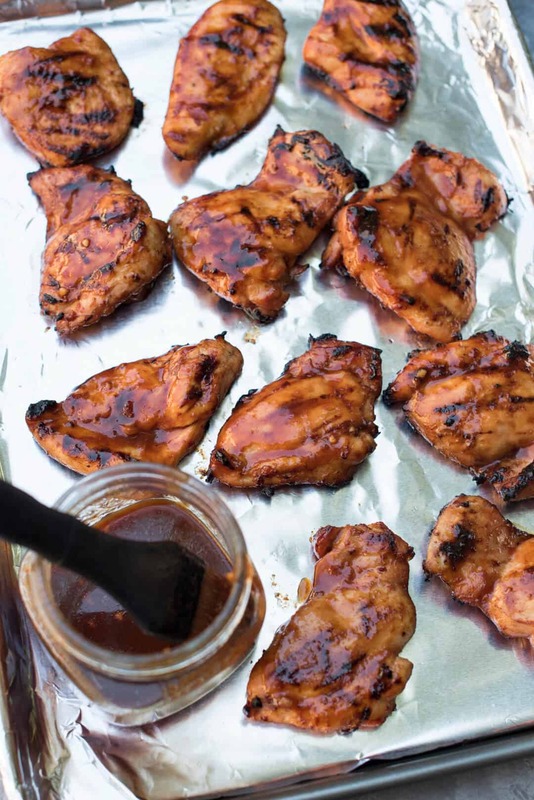 The marinade consists of your favorite bottled BBQ sauce combined with a list of ingredients that will make your mouth water. 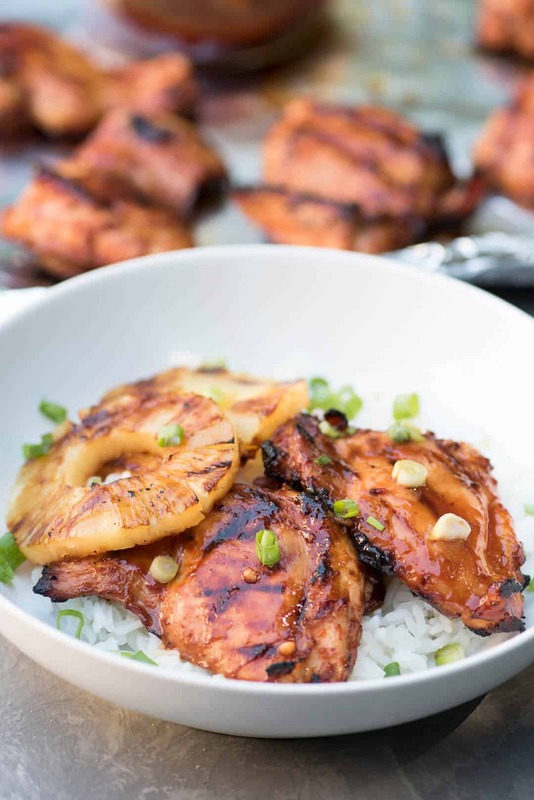 Pineapple juice, soy sauce, fresh ginger, minced garlic, and the ingredient that makes it completely impossible to resist – a little sesame oil. What is it with that stuff? Holy cow, is it good. I used an assortment of boneless, skinless breasts and thighs but you could use any chicken pieces you love. Drumsticks would be delish. After the chicken spends some time marinating in this delicious mixture it is basted with some of the reserved marinade while it grills. The result is perfectly caramelized, golden brown pieces of tender, flavorful chicken. I used the juice from a can of sliced pineapple in the marinade and then towards the end of the grilling time the pineapple slices joined the chicken on the grill just long enough to get some nice grill marks on each side. An important note for your shopping list – be sure to pick up a can of sliced pineapple in JUICE, not heavy syrup. The juice from the can is an important component of this recipe. A great kitchen hack! Store your ginger root in a small freezer bag in your freezer to keep it fresh and ready for recipes. Use a microplane/zester to zest it right into your recipes. It works beautifully! Strain and reserve the juice from the can of pineapple slices. Set aside. Combine BBQ sauce, 1/2 cup of reserved pineapple juice from can, soy sauce, sesame oil, minced garlic, and minced ginger in a small bowl. Measure out and reserve 1/2 cup of the marinade for later. Pour remaining sauce over chicken in a plastic storage bag. Refrigerate for 2 to 8 hours. Grill, basting with reserved sauce during last 5 minutes of cooking time. Continue cooking until chicken reaches an internal temperature of 165 degrees F.
Brush both sides of pineapple slices with vegetable oil and add to the grill towards the end of the cooking time. Cook about 2 minutes per side, or until slightly softened and nice grill marks appear. 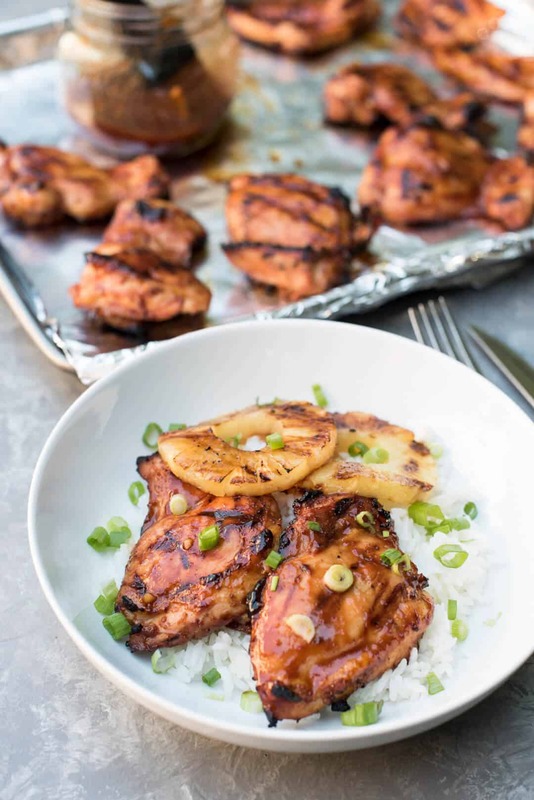 Garnish grilled chicken with green onions and serve over rice. Prep time does not include marinating time of 2 to 8 hours. Check the label on your pineapple slices to be sure the pineapple has been canned in pineapple juice, not heavy syrup. 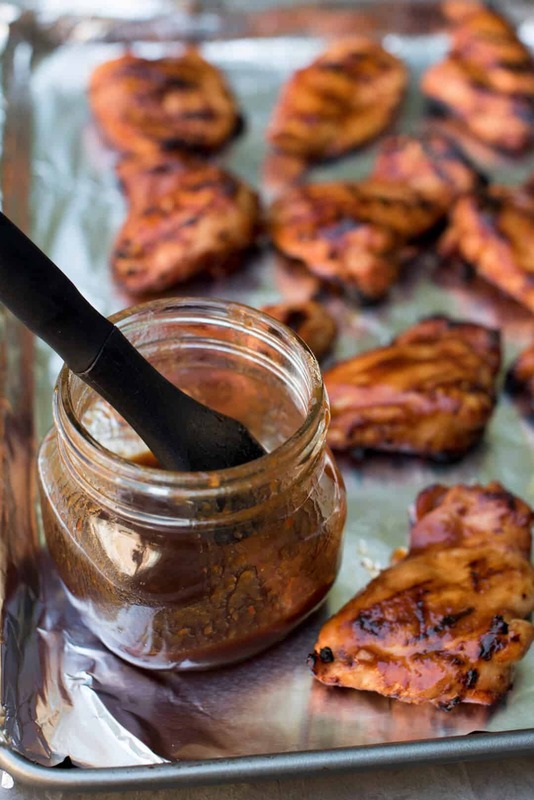 Before adding the chicken to the marinade be sure to reserve 1/2 cup for basting during the grilling time. 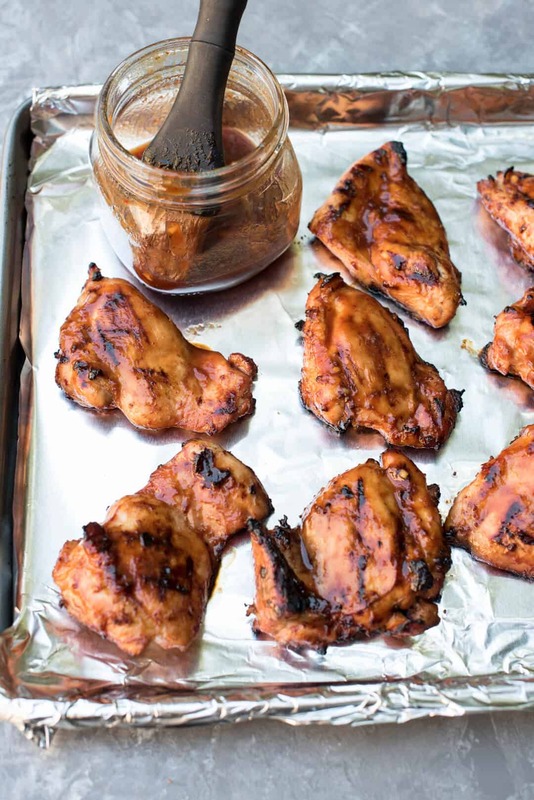 Chicken should not be basted with the marinade that has been used in the marinating process. 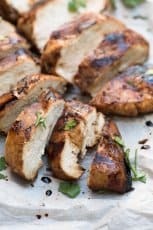 This chicken looks delicious and so easy. Which reminds me I miss your Costco hauls! Happy 4th! Have you tried on Pork Chops? I haven’t but I do think these flavors would be fabulous with pork! I love bbq chicken. This recipe seems simple enough. I would try it out. Hi what type of grill are you using ? Hi Quessie. 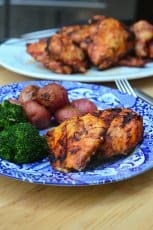 This recipe can be cooked on an indoor or outdoor grill and I’ve done it both ways. The grill I’m using in the video is by Aroma and similar to this one here http://amzn.to/2t5UNcx (affiliate link). Looks yummy!! I’m making this Friday.thanks so much! There Re so many different BBQ sauces! Can you share which one you used for this recipe? My favorite is Kinder’s Mild BBQ Sauce. 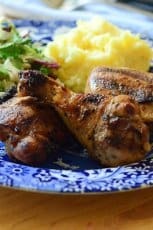 Can the chicken be grilled a day in advance and then served next day in a crockpot? If so, what can you use in pot to keep meat moist, tender and jucy? Can you grill the chicken a day or two in advance? If so, what can you use to keep chicken moist, tender and juicy? I want to make this for July 4th and want the meal prepped as much as I can ahead of time for 18 people. Chiken and pineapples are my favourite hawaiian mix!!!! Thank you for this recipe!